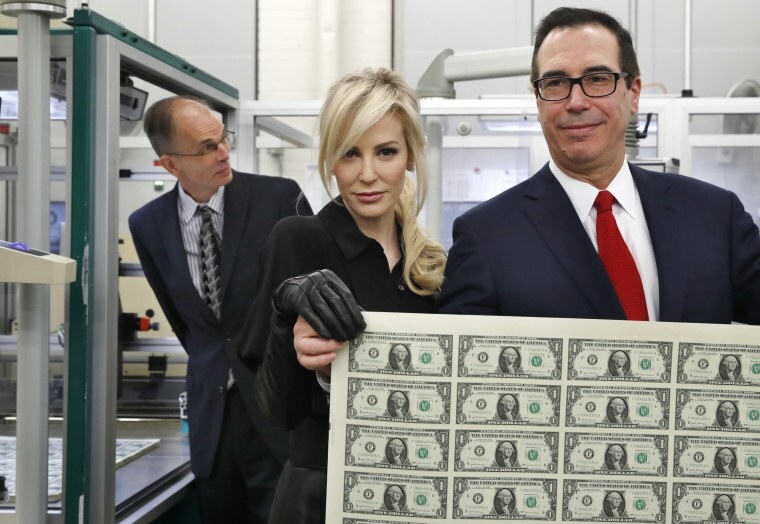 Mnuchin, accompanied by his wife Louise Linton, examined sheets of $1 bills at the bureau's Washington printing plant. Treasury Secretary Steven Mnuchin and U.S. Treasurer Jovita Carranza are now on the money, literally. The two officials took a tour of the Bureau of Engraving and Printing on Wednesday to see firsthand the production of new $1 bills, the first currency that will bear their signatures. Mnuchin's signature is decidedly more legible than that of his predecessor Jacob Lew. Lew had handwriting that was so sloppy that former President Barack Obama once joked that unless he made his signature more legible, it might debase the currency. Carranza and Mnuchin, accompanied by his wife Louise Linton, examined sheets of the $1 bills at the bureau's Washington printing plant. The currency will be shipped to Federal Reserve regional banks around the country, and the new bills are expected to go into circulation in December. Both Treasury officials provided 10 sample signatures, from which one was chosen for government engravers. Signatures of Treasury secretaries have been appearing on U.S. currency since 1914.